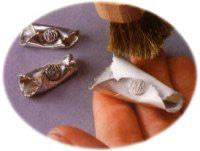 To polish to a high shine, the metal should be burnished, either by hand or through mechanical polishing. It is best to use the fine sandpapers to clean out any imperfections before you fire, and then after you fire polish with a soft brush and sand, using various grits from rough to super fine, to get a mirror finish. Or use a steel burnisher to rub the surface smooth. Follow with a light treatment of polishing compound. Tumblers, in which small rods and spheres of steel are tossed against work by a rotating drum are ideal because of their speed and ability to polish without damaging the surface. However, tumblers polish your imperfections. Perhaps the most obvious option for finishing is to leave the Precious Metal Clay or Art Clay with the finish achieved in the kiln. In a piece that will be rubbed during wear such as a ring, the raised areas will be burnished naturally while the recesses remain white (silver) or yellow (gold). Precious Metal Clay or Art Clay is metallurgically just like other metals but structurally a little more porous. It can be joined by using the same flux, solder and torches as silver and gold, but because of its porosity, Precious Metal Clay or Art Clay will "soak up" solder. When possible, prepare an area to be soldered by burnishing to close the pores and reduce the tendency to absorb solder. Even then it's important to use a delicate hand with the torch, removing the heat as soon as solder starts to flow. Of course even in conventional metal, fine silver and gold behave a little differently than their more familiar alloys, so care and attention is recommended when first soldering Precious Metal Clay. Because of its porosity, Precious Metal Clay or Art Clay objects can retain pickle unless they are thoroughly rinsed. Neutralize the acid by boiling the pieces in a dilute solution of baking soda and water or by cleaning them in an ultrasonic machine for about 15 minutes. Silver Precious Metal Clay or Art Clay can be oxidized with Liver of Sulfer Prepare the Liver of Sulfur as per the directions on the container, use with good ventilation as it smells BAD! Pure gold is very difficult to color in this or any other form, and will require commercial solvents, paint or plating. But why would you want to?